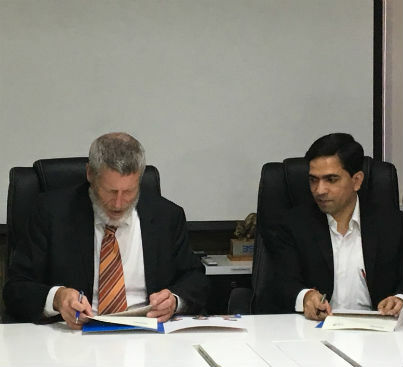 Mumbai: The University of Canterbury signed a Memorandum of Understanding with the Bombay Stock Exchange Institute Limited yesterday in Mumbai. Commencing in October this year, students will be welcomed into UC’s programmes including the Masters of Business Information Systems, the Masters of Business Management, and the Master of Applied Finance and Economics. Under the Memorandum, BSE Institute will prepare students for overseas study through a one-month preparatory programme. Students will then travel to Christchurch, New Zealand to complete their post graduate studies. The two institutions have also committed to collaborate on a number of research projects focused on big data analytics and data science. This research will complement their teaching programmes in these areas. “The University of Canterbury is very excited to create closer ties with the Bombay Stock Exchange Institute and to create pathways for students to pursue Dr. Rod Carr, Vice Chancellor of the University of Canterbury signs and MOU with Mr. Ashok Patel, Authorized signatory for BSE Institute Ltdinternational studies that further their career aspirations” said Dr Ian MacDonald, UC’s Director of International Relations.